The Waterfall comforter easily adds style and comfort to your bedroom. The beautiful flowing ruffles are a crisp color which enhance the charming look of this comforter. A solid color covers the reverse for a clean look. Made from polyester this comforter is machine washable for easy care. Includes two decorative pillows. Love this bedding! It is really pretty in person and the pillows it comes with are an extra plus! Two things to think about though: 1. The ruffles do not go all the way up (I still think its really cute though!) 2. The quality is not great. This is just for my dorm room so its fine for me but if you are counting on it lasting a long time I would take this into consideration. Overall I love it though! This is a very cute comforter. My daughter loves it. The color is true to the picture and it's very soft. It's got a very cute princess design and fits my daughter's 10 inch mattress better than other comforters I've tried. I bought this product for my daughter, because she wanted to redecorate her room. She found this bedding online and fell in love. The photos are very deceiving. The ruffle on the queen sized comforter do not even go up 1/2 of the way. Not only is the product not what we expected look wise, but the material is awful, it is very bad polyester. After I read some of the reviews I seriously waffled on buying this and the matching dust ruffle. I am so glad I went ahead with the purchase. I used this in the spare room and the whole room brightened. Critics were whining about the ruffles only being on the bottom one third. I don't have a problem with that since it makes the top of the comforter lighter weight. The whole comforter is light weight poly/cotton feel material. Adding the blue microfiber sheets and the dust ruffle made my whole room bright and inviting for a reasonable price. My young adult guests were really pleased and the comforter fuffs and knocks the packing wrinkles out easily in my dryer with the addition of a damp cloth and dryer sheet. Glad I didn't listen to the bad reviews. Most people know they aren't going to get a $1000 comforter for $100 or less. Some people haven't learned that yet. Similar comforters are too expensive and this one serves its purpose beautifully at a reasonable price. I am pleased with the quality as this comforter is being used as décor only. It is not being used for warmth. Material is good, therefore, I expect it to last for the time I need it. One thing I did not notice until I received the product...the ruffles do not cover the entire comforter. The ruffles are only along the bottom half of the comforter. This was all I needed anyway. Very pleased with this purchase! Great for my daughter's bed. She loves it and it seems like it will last a long time. I love this comforter set, it’s exactly what I was looking for. It’s simple, which is the style for my bedroom. I knew the ruffles did not go up all the way and I excepted them to be higher up BUT if you fold it the right way it looks really nice! I also bought two extra pillows and don’t use the small one with the blue flower because it doesn’t match my room. Also, it’s so wrinkly when it comes out the bag but nothing you can easily fix. In conclusion I love it! This is the most beautiful comforter set I have ever seen! My granddaughter wanted a new comforter for Christmas. She asks for it to be white and then decorated with the mainly yellow decor. I was thrilled when I went to Overstock.com and found exactly what I thought she had in mind! I was able to get the matching bed skirt also! It is ruffled on ruffles on ruffles. Exactly what a thirteen and a half-year-old girl wants! The fabric is really nice and soft to the touch. Big plus is that it is machine washable. Granddaughter was delighted with the set. and did not mind that the ruffles did not go all the way up. She figured a way to make it go up a little higher and then uses a lot of throw pillows. 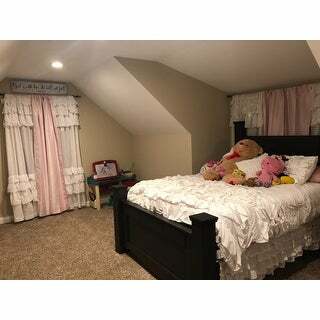 The room also now has beautul white curtains also from Overstock.com that really sets the room off too. Thanks for all the bargins and quick, free ship at Christmas time!. I bought this set for my 10 year old daughter for Christmas. Although I haven't given it to her yet, I've opened it and it is beautiful! It's a very soft comforter! And the color is very vibrant (I bought the blue)! I would recommend this to anyone wanting to liven up a bedroom! Our daughter picked this set for an antique farm bed. What we didn't count on was relying on it while we slept on the floor for 9 days -- until our moving company -- got its act together. This set, although the fabric doesn't feel high end, performs superbly when layered correctly. Most of the ruffles happen only at the end of the comforter, as other reviewers have noted. But care in layering makes this issue less annoying. The comforter is very light and fluffy and soft, in a way that is more high end. The ruffles on the shams never seem to know which way to fall, but daughter likes the embroidered small decorative pillow. This comforter hasn't been laundered yet. We're hoping the less fancy fabric means that there won't be any ironing! Very nice set and daughter likes it a lot! This bedding is absolutely perfect for my little girls room. It's soft and seems to be well made for the price. Very pleased with it. Looked great for a while, but lost a lot of its color in the wash, after a few washes it looks a bit worn out. Bought this for my teenage grand daughter. She was delighted with it. The colors were bold and the quality was very good. Purchased this for my teen’s bed. 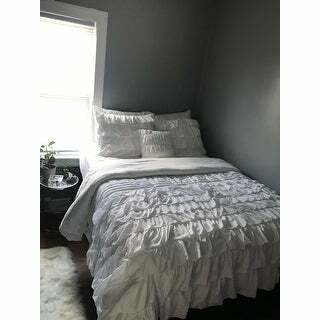 This is a beautiful, lightweight and feminine comforter. Looks great with her shabby chic bedding and decor. The shame are darling and add a nice extra touch. My daughter loves her new big girl comforter, the style is great for tweens. The soft textures allow comfort and style to mix. The sham and throw pillows add to the look. I would definitely buy this comforter again. Very bright white comforter. The ruffles on the lower half are very pretty but wish there was some kind of decoration on the top part. It is a soft and lighter weight comforter. pretty bedding set and looks very much like pictured, however the fabric is a bit flimsy and not very heavily stuffed. the fabric also has a slightly nylon feel so not a cotton. I still gave three stars because it ends up looking nice when fully made just not very high quality fabric. I love this comforter set. It is super white (not off white or washed out) and super soft. It is easy to wash as well. I can easily fit it in my home washing machine. I am very happy with this purchase. Love! Could be a little wider, but nice. Super cute for my daughters room. Love the white ruffles. Quality wasn’t what I was hoping for but it was also extremely inexpensive. Got what I paid for and gave it to my daughter. "Do you have this in gray"
"are the ruffles all the way up the bedding??" There are 9 ruffles that go up 1/3 of the way , followed by 4 thin pleats. Then plain to the top. It's beautiful. "This says 3 piece set, yet is listed as: 1 comforter, 2 shams, 2 decorative pillows. This usually would be called a 5 piece set. Can anyone confirm are you getting 3 or 5 pieces? Looking for Twin size (I'm wondering if the twin size only comes with 1 sham and 1 decorative pillow?). " I realize we have incorrect content information listed. Twin size gets one sham, one comforter and two decorative pillows. It is total of 4 pieces for the Twin size. We will have this information corrected. I'm sorry for the confusion. "What color is the blue? I'm looking for this in aqua." Hello kc5891, we try to represent the colors of our products accurately. Unfortunately, due to the difference in monitor colors we cannot guarantee that the color will match exactly what you see on your screen. In my opinion this comforter set appears to be more blue than aqua. Thank you for shopping with us.